We have partnered with Markzware for all our file conversions. Not only are the results superior to the back-saving method, but the variety of files that can be converted has increased as well. 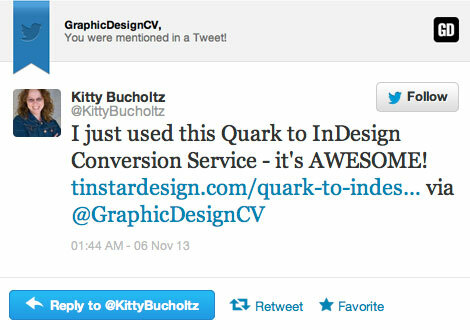 If you'd like to convert your Quark file(s) yourself (and you have the legacy Quark software), you can perform a straightforward conversion of the file to InDesign by back-saving your file to Quark version 4, and then importing it into InDesign Quark to InDesign conversion technique demonstrated here. However, if you don't have the relevant software,you'll need to either install the InDesign CS3 / CS4 / CS5 / CS6 / CC plugin Markzware Q2ID, a conversion tool that will import any Quark file into InDesign, or use the Markzware Conversion Service. If you'd like to go ahead with a Markzware file conversion, please click here to begin the process. All files and information uploaded will be treated with complete confidentiality. What do you send to Markzware? PLEASE ONLY SEND THE QUARK FILE. Fonts and images will not be required. Please ensure that no images are embedded, and they are all linked to external files. Once the file conversion has been completed you will be emailed a link to retrieve your converted file. What other files can be converted? This is perfect (and quick) - thanks so much! Thanks a lot for the quick turnaround! You saved us a lot of time. Thanks for the file. It's working like a charm. Great. Thanks man. Everything converted just fine. You saved me a rebuild! Thanks so much for dealing with it so promptly. 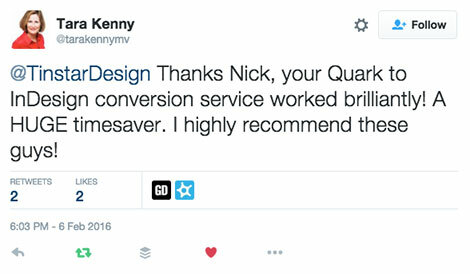 I will definitely recommend your service to everyone I know with this issue to deal with.